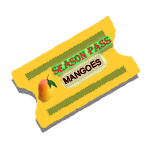 Enjoy a box of the world famous Malgova mango from Andhra Pradesh and Tamil Nadu in India. 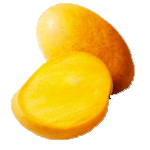 Malgova Mangoes are among the most popular mangoes in the state of Tamil Nadu and one of the traditional varieties. Ballads and poems abound on the fragrance and flavor of this mango in literature. The yield on the Malgova mango tree is low, so it is becoming increasingly rare in the marketplace.